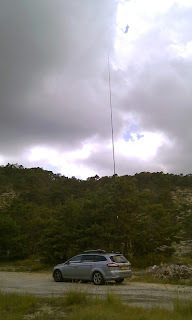 While in the Provence I went over to Parc du Verdon to activate another WFF location. I found a place near Peyroules that was on a hill and had generally a good view except for trees and hill top to one direction. After calling CQ for a few times I found out my modulation was terrible. Somehow the combination FT897 and Heil microphone didn't work out. The FT897 was just repaired so all the settings were back to default. I couldn't quickly figure out how to tweak the settings so I took my hand microphone (that I always take with me for emergencies..). With some tweaking I got this working to an acceptable level. The next challenge was the weather. Apart from quite a bit of rain I was also visited by two thunderstorms. They brought a steady S9 level of QRN and the danger of lightning. This limited my air time to less than 90 minutes. The last challenge was the level of QSB that was very high during the activation. During the 90 minutes I worked 64 stations from 15 DXCC entities. The maximum distance covered was 4700km into Asiatic Russia. 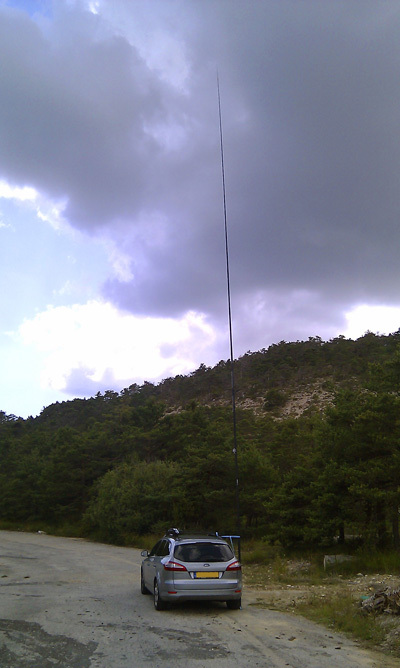 Considering I was working with far more power than during other activations (I brought my FT897 in stead of the QRP rig FT817) I expected to work more stations. 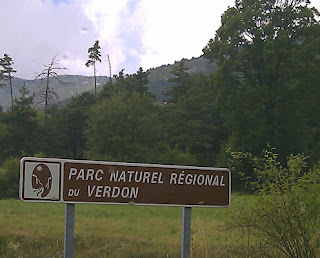 I did not have an opportunity to go back to the Parc du Verdon during my stay in France so the next activation will be from somewhere else - probably a PA region once again.